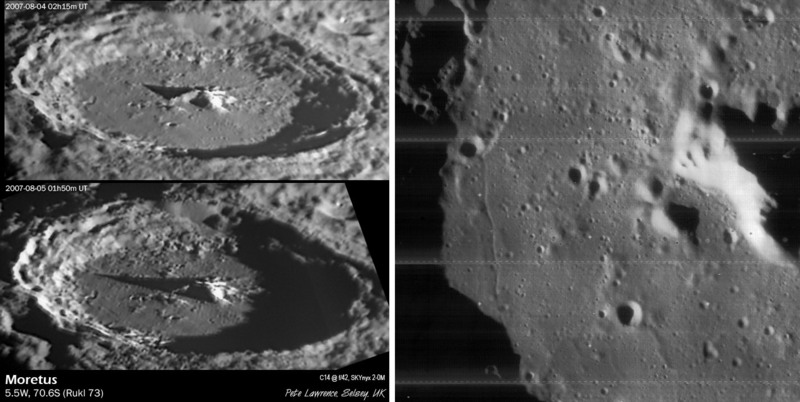 top and bottom left images by Pete Lawrence, Selsey, England; right image from Lunar Orbiter IV-130h2. South up. Pete’s two images of Moretus, showing the change of shadows and illumination over 24 hrs, provide two chances to marvel at the complexities of craters. Both views emphasize the great variation in the inner wall terracing. For almost all the length of the illuminated wall there are about three terraces (identify by counting the light-reflecting scarps at their tops), with the material below the scarps being rounded tubes of collapsed wall rock. At the southwest (upper center) quadrant there is a large scarp about 2 to 2.5 times as high as other scarps. For some reason this portion of the wall collapsed all together, creating one major scarp rather than three smaller ones. Pete’s bottom image also shows that the bottom left portion of the floor is smoother than most of the rest. And near the far left crater wall on the smooth part there is a nice little crater chain. Checking the smooth floor and crater chain on the Lunar Orbiter IV image (right) I discovered a rille on Moretus’ floor! And this thin little rille is also visible on Pete’s images - see the short, straight, shadow-casting line near the crater chain? On the Orbiter view, low buried ridges are visible. I assume that the smooth material is impact melt which covers earlier fallback, creating the ridges. Rilles - perhaps tension cracks formed as the melt cooled and solidified - are uncommon on impact melt within other craters. The alternative is that this is a volcanic unit, and there is little evidence to dispute that interpretation other than the belief that there is no volcanism in the highlands…. This page was last modified on 18 August 2018, at 19:01. This page has been accessed 1,246 times.